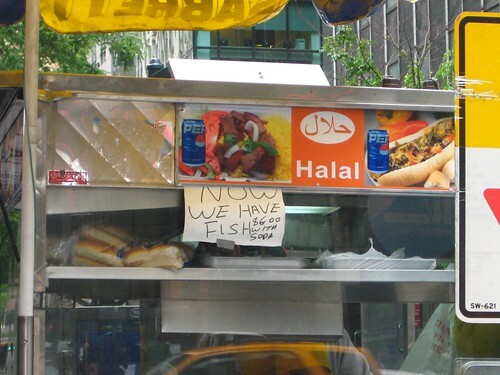 I asked last week if any one had ever tried the the fairly nondescript 41st St & 3rd Ave Halal cart, specifically their fish. Since discussing A Salt & Battery and Chip Shop’s fried specialties were deemed more important (this I can understand, both are filled with fried goodness) I took it upon myself to go back yesterday to try out the $6 Fried Fish. What I discovered was the Midtown East equivalent of Kim’s Aunt’s fish sandwiches. Check it out after the jump. Instead of the flounder or whiting at Kim’s Aunt, this cart is offering up fresh tilapia only. And it doesn’t come between two slices of bread like a neat little sandwich. 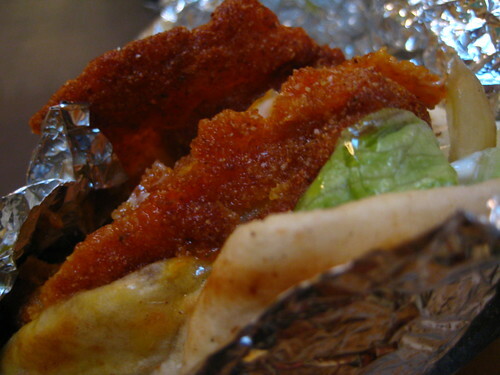 You can get this baby in a pita or with rice, just like any other meat. I chose to eschew rice and go with the pita wrap. I am a little faint at heart when it comes to fish from a cart, so I made sure to watch the production. Each piece of fish comes from its own vacuum-sealed bag, and is breaded on site before being placed into the deep fryer. And when it comes out about a minute later, it’s crisp to fine fried deliciousness. The breading has some faint spices supplementing the tasty fish, and it’s a good size hunk of fish you get. 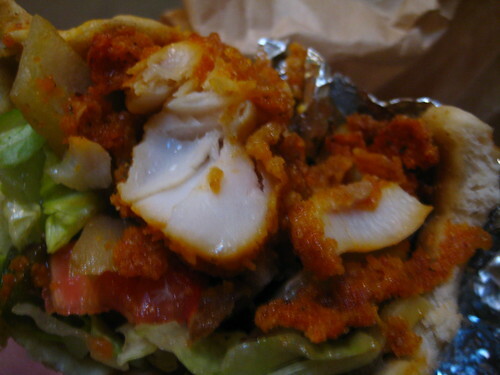 My pita wouldn’t fully close, not that I minded losing a few pieces of my fish. This is definitely an answer for the few workers who want a fresh fried fish lunch, but can’t make it over to the Grand Central Oyster Bar. Interestingly enough, this is also one of the rare carts that offers BBQ sauce-no word yet on the BBQ fish pita though. I’ll be having that next week. Posted by Blondie at 9:30 am, May 20th, 2010 under Cart, Seafood. I am actually seeing more and more carts serve fish nowadays. It’s kind of funny how all the other carts check this site to see what’s the next new trend. But the Kim’s Aunt Kitchen Cart’s fish sandwich is awesome because it’s huge in comparison to this thing. I’ve had many a day when I craved a fish sammich of the sort, but was left unsatiated by Kim’s being too far west of me. This is a little south of my boundaries, but i’ll give it a shot on a slow day. I tried this cart today, but decided to get the normal chicken-over-rice instead of the fish. I’ll try the fish next time. Chicken was okay, nothing like Biryani Cart, my fav. Some pieces of chicken are very dry, some are nice tender. This is 39th and 3rd, not 41st. if you went to the 39th and 3rd cart, you went to the wrong one. 41st and 3rd is my go-to, as i’m right around the block from them. nice husband and wife (or so i assume) team. you also get a can of soda with their chicken/lamb over rice…all for 5 bones. I went to the wrong cart?? But the cart I went to at 39th and 3rd has the exact same “We now have fish” sign, with price. What gives? I’m thinking this cart moves. I swore the first time it was on 39th, then when I got the sandwich it was on 41st. I thought that maybe it was just me, but now I’m thinking it warrants further investigation. they def don’t move, as i work right around the corner and get a mixed over rice at least 2x a week.